A manufactured home addition, or modular home addition, can dramatically speed up your home remodeling project and reduce interruptions to your family’s lifestyle, particularly if they plan to stay in the home while the work is being done. Unlike traditional home construction projects, with manufactured home additions much of the work is done offsite. As a result, you can save money and hassles due to the fact that the construction crews will spend less time at your home site. Also, unlike in years past, modular home additions are constructed on par or even better than today’s stick built homes and home additions. Part of the reason for this is the fact that manufactured home additions have to survive the transportation to the job site, which necessitates additional structural integrity not always found in today’s stick built construction. Manufactured home additions are available in two basic types, ones that connect onto the side of your home and others that connect on top of your home to create two story homes. Prefab room additions for mobile homes are also available today. Modular home additions that attach to the side of your home are typically used for creating family rooms, in-law apartments, bump-out kitchens, dining rooms and great rooms. Second story manufactured home additions usually include multiple bedrooms and baths. A modular second story addition is a much faster and more efficient way to go when building up. When putting on a second story, the home needs to be temporarily vacated. A second story modular home addition helps to dramatically reduce the time that the family has to live in temporary housing, compared to stick building it. Get one of these new home construction or home remodeling checklists and save time, money and construction hassles. Before moving forward on a manufactured home addition project it is important to first check to see if you legally can. Take a look at your property plot plans and visit your local building inspector and/or zoning officer to see if there are any issues with you building a home addition. Also, if you are part of a homeowners association make sure to check with them too. Make sure there are no deed restrictions, covenants or easements that will prevent you from building a manufactured home addition onto your home. Also, you’ll need to find out whether or not you’ll need to bring the rest of your home up to various residential building code standards, e.g. fire code, if you attach an addition onto your home. In addition, there could be separate issues if you are going to build a free standing room addition that doesn’t directly attach to your home. If you have a septic system on your property you may also be limited to where you can put the home addition. Moreover if the home addition is to be a bedroom you may need to have the septic system modified to support the additional bedroom. Prior to actually signing a contract with a home addition manufacturer or building contractor it is important that you have your finances in order first. For example, you may be paying a portion of the construction in cash and need to obtain financing for the rest. Make sure you are approved for financing before signing a contract with a home addition manufacturer or contractor. See How to Finance a home addition. Once you’ve got the approvals for building a home addition and the financing in place, you can then begin the real work in earnest. Work with home addition manufacturers or modular home builders to develop a set of construction plans that meet your family’s needs. Once the plans are nailed down you can then obtain accurate costs and pricing for your modular home addition. Make sure when visiting modular home addition manufacturers to bring plenty of photos of both the outside and inside of your home. Also have dimensions of the home as well. With this information they can more quickly and accurately to develop a set of plans to match your needs. Also, when you’ve narrowed down your list of prospective home addition manufacturers insist that they come out to your home to view it in person. This way you can prevent unnecessary mistakes in your home addition’s plans and construction. When constructing a modular home addition it is advisable to use a general contractor to oversee and manage all of the onsite work. 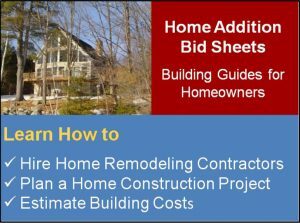 This home remodeling guide will help you find the right general contractor. With home addition construction projects there are always surprises and issues that come up. An experienced general contractor will be able to anticipate many of these surprises in advance and will have proven ways to address them quickly and cost effectively, and most importantly, with no frustration and aggravation to you. The general contractor will also hire all the necessary subcontractors to perform the electrical, plumbing and other items that will need to be done to marry the modular home addition to the existing home. 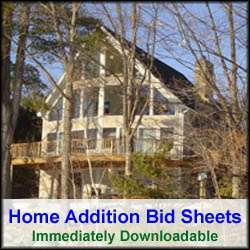 See my Home Addition Bid Sheets to learn how to hire a general contractor. So if you are contemplating a home addition project its worth visiting a modular home addition manufacturer and comparing their offerings to the traditional stick built home addition route. You may well fine that the modular home addition costs is financially a much better solution for you and your family. Free Manufactured Home Addition Price Quotes with No Obligation! Fill out our 3-5 minute quick and easy form, and receive a free price quote on a manufactured home addition from one of our prescreened and licensed home addition contractors. This process is free and there is no obligation to continue once you receive your home addition cost estimate.